In the advent of authoritative experiments and evidence-based methods in security research [2, 4, 21, 29], we are convinced that privacy and identity research will benefit from the scientific method, as well. This workshop offers an introduction to selected tools of experiment design and systematic analysis. It includes key ingredients of evidence-based methods: hallmarks of sound experimentation, templates for the design of true experiments, and inferential statistics with sound power analysis. To gauge the state of play, we include a systematic literature review of the pre-proceedings of the 2016 IFIP Summer school on Privacy and Identity Management as well as the participants’ feedback on their perception on evidence-based methods. 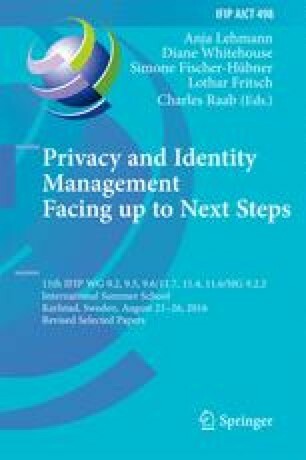 Finally, we make our case for the endorsement of evidence-based methods in privacy and identity management. K.P.L. Coopamootoo—Major contributions were made while the author was at Newcastle University. We are grateful for the contributions and feedback from participants of the workshop. We are grateful for the discussions with Roy Maxion on evidence-based methods for cyber security. The preparation of the evidence-based methods workshop was in parts funded by the EPSRC Research Institute in Science of Cyber Security (RISCS), grant EP/K006568/1. This work was supported by a Newcastle-sponsored International Research Collaboration Award (IRCA) for work with Carnegie-Mellon University (CMU). We have been asked by a number of people, whether this paper could be used as primer for lectures or student projects. We certainly approve of that. We ask that the paper be cited and the corresponding author sent a brief notification, such that we can track interest in evidence-based methods in the community.